It's true, home fires are more prevelant in winter than in any other season. This is due in part to an increase in cooking and heating related fires. Heating, holiday decorations, winter storms and candles all contribute to an increased risk of fire during the winter months. 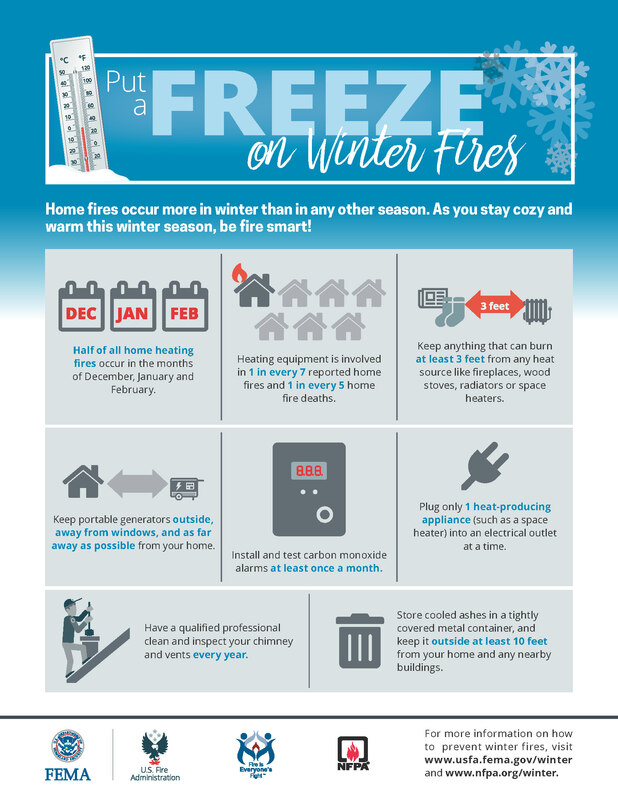 Follow these tips to help reduce your risk to winter fires and other hazards, including carbon monoxide and electrical fires. Read manufacturer’s instructions for the number of light strands to connect. Make sure your tree is at least three feet away from heat sources like fireplaces, radiators, space heaters, candles or heat vents. Make sure your tree does not block exits. Get rid of your tree after Christmas or when it’s dry. Keep portable generators outside away from windows and as far away as possible from your home.